Hi, last year I was lucky enough to join rent a tiger on their Marocco trip. I'm wanting to go again next spring, but the web site hasn't been updated for ages and no reply to an email. Does anyone know if they are still doing trips or renting out bikes? It would be a shame if they no longer operate. 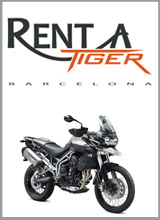 Re: Anyone got information on Rent a tiger? I believe they are still on the go, they were mentioned on the HUBB as a possible place to rent a bike for their Mountain Madness rally. Thanks Arma, I'll wait for a reply to my email, though I was curious as to why the website wasn't updated with pictures of the Morocco tour for last year and there was no mention of a tour in 2016, I'm just hoping they are not playing safe from a terrorism perspective, it would be a real shame for all the negative reinforcement and loss of all the positives. I guess if this is the case it's understandable from a business stance . I've just logged in and seen your message. I did the Morocco trip (in 2014) and was thinking about it again, so I chatted with Anton on WhatsApp at the beginning of October. He told me he doesn't have dates yet for 2017. I'll send him a link to the page here and maybe he can reply. Thanks for that Guiri, I did it with them last year and it was an amazing trip, so want to find out if more were planned, there is no update on his website from your trip is think. I'm just arrived from Morocco, running a tour for another company. In 2017 we will run our own tour again between April 18th and April 30th, starting and finishing in Málaga. It is true that I'm not very active on the Forum, but next week I will paste the itinerary confirming the exact dates, and probably some pics from the last two editions. Good or bad, we are happy to be in the business. We have increased our fleet with new bikes, not only Tigers, so a new brand has already been registered for operating. The new website will come next. Hi Anton, thanks for the message, I'm pleased your fleet is growing, though I think the tiger is simply brilliant. I really enjoyed my Morocconame adventure with you and am looking good again at the start of April next year, which as Guiri explained is earlier than you plan to go - this is based on the timing of my friend is shall be travelling with., but I'll check out your website later on. The dates for the next Morocco Tiger Adventure edition will be 18-30 April 2017, starting and finishing the tour in Málaga as usual. Hotels and ferries all confirmed, will open a new post with all the details and prices on the Forum this weekend. I'm going again after my great experience in 2014.